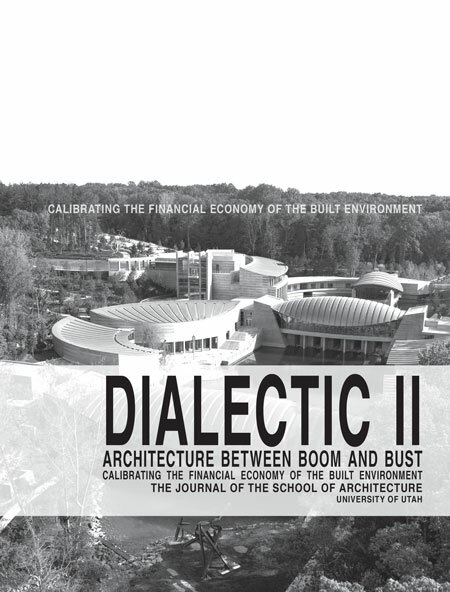 Dialectic is the new journal of the School of Architecture at the University of Utah. True to dialectical thinking, the journal brings together opposing voices in the discipline on architectural, urban and wider cultural issues. Deliberately housed within academia, it invites voices from practitioners, scholars and educators to address pedagogy as much as practice. It publishes global perspectives for taking local action. Dialectic is a critical venue for articulating alternative positions on challenges in the highly interconnected, yet tragically disconnected world of contemporary architecture. The second issue of Dialectic, “Architecture between Boom and Bust,” is dedicated to the question of economy. While the boom of the 1990s and 2000s made architects and media designers the epitome of the urban creative class, the credit crunch and economic downturn of 2008 dramatically shrunk the profession. With the collapse of the U.S. housing market arguably the trigger for global financial and economic crisis, the building industry became a primary victim. All this has directly affected architects, whose fees are linked to building costs and built volume. Dramatic economic turns, while involving individual hardship, are nevertheless great indices for making visible the immanent connections of the discipline to the marketplace. They challenge our understanding of what it means “to architect.” The history of the architecture profession in the twentieth century bears witness to the attempts of the Modern Movement to bring the elite cultural products to the ordinary person. Architects in the 1960s critiqued the paternalism of their disciplinary forebears and interrogated the role of an architect both as a social engineer and as a moderator of participatory design. The accompanying post-modern turn to semiotics and imagery moved the discipline to the opposite position of “art for art’s sake.” The public learned to expect extravagant signature buildings, formal experiments and endless artistic ingenuity. With this, they traded the role of the architect as a keeper of a common good for a celebrity figure who would bring global fame and tourists to their communities. Now, following the economic downturn in 2008, what may we expect from the next calibration of architecture to society?